Coinciding with today's release of iOS 12.1.1, additional carriers around the world are enabling eSIM support on the iPhone XS, iPhone XS Max, and iPhone XR, allowing for dual-SIM functionality on those devices. According to Apple's website, the latest carriers supporting the eSIM feature include AT&T in the United States; Rogers and Fido in Canada; 3 in Denmark and Sweden; Orange in Poland and Spain; Telia in Estonia and Finland; Telenor in Norway; Swisscom and Sunrise in Switzerland; Vodafone in Qatar; and select others. In Asia, the eSIM feature can now be used with 1010, CSL, China Mobile, and SmarTone in Hong Kong; M1 in Singapore; APT in Taiwan; Airtel and Reliance Jio in India; and AIS, dtac, and True Move in Thailand. AT&T's website confirms that it supports eSIM on the latest iPhones as of iOS 12.1.1, while Apple's website continues to state that Verizon and T-Mobile will offer eSIM service "later this year." We've heard from a few people that Verizon may enable support on Friday, but this is strictly word of mouth. It seems that the rollout of eSIM functionality on iPhones is hit or miss at this point, as a MacRumors tipster claims to have set up eSIM with T-Mobile on the new 12.9-inch iPad Pro, while others have had no luck. The ball is definitely rolling, though, so hopefully eSIM support is more widespread by year's end. The eSIM, or digital SIM, is a non-physical SIM card slot that pairs with the physical SIM card in the iPhone XS, iPhone XS Max, or iPhone XR to enable dual-SIM dual-standby, a feature that lets iPhone users have two phone numbers available at once — useful for travel or both personal and work lines on a single iPhone. People always give ATT crap for their service and other issues, but they're always one of the first carriers to support iphone changes and new technologies. Three in the U.K. not supporting. I have a Three personal SIM and Vodafone SIM for my company mobile. Neither of which support eSIM. Actually, support in the U.K. is pretty awful. Welcome to the hell that is signup. Won't work with CDMA carriers. You can only have one CDMA carrier and one GSM, or two GSM carriers. I stand corrected! You're right! That's..... weird. Does anyone know the technical issue on this, and if it is something that can even be fixed? I walked into the Ithaca NY AT&T store today, bought a eSIM QR card ($5), and got everything working by talking to the 800-number technical support line. (The store did not know how to activate the eSIM.) Not a problem. – go to settings -> cellular. Tap “Add Cellular Plan” and scan the QR code. I got the impression that this is the same procedure as adding a new physical SIM, and AT&T support was completely unfazed by it being an eSIM. I am not sure why you were charged. I was given one for free and in fact on the back of the card there was a price tag that said $0.00. I was given one from my AT&T store for no charge. In fact on the back of the card there was a price tag that said $0.00. Everyone in this thread is wondering HOW you did. Here are the details of what I did. It took about 10 minutes in an AT&T store. 1. I have 2 phones, a 7 Plus and a Xs MAX. I wanted both numbers in the Xs Max. 2. I put the AT&T SIM card from my 7 Plus into the sim slot of the Xs Max. This became "Primary". 3. I then scanned the QR code from the card that the store game me (for FREE) from the SETTINGS>CELLULAR>ADD CELLULAR PLAN link. 4. I answered a few prompts asking me about which would be primary for data, calls, contacts...etc. 5. When I was done with that, the guy in the store had to log into their system and associate my number (previously on the physical SIM) with the new eSIM number from the card. This step associated my number with the "Secondary" phone number on the phone. I can re-label them in SETTINGS. Once he did that, it worked perfectly. It was very painless, especially considering I was the first one from that store to request it. The physical SIM that is now in my phone is the SIM from my company's corporate mobile phone that is assigned to me. Thus I have accomplished my goal, separating my work number from personal number but only carrying one single device. all things considered, the setup was very simple and straight forward . Now to mess around with the settings. More fun tonight. Just don't ever have any issues. They don't know what real Customer Service looks like now a days. Their policies are so iron-clad that they won't budge even if it was their employee that made an error. I just recently switched to T-Mobile. Night and day difference. Coinciding with today's release of iOS 12.1.1 ('https://www.macrumors.com/2018/12/05/ios-12-1-1-released/'), additional carriers around the world are enabling eSIM support on the iPhone XS, iPhone XS Max, and iPhone XR, allowing for dual-SIM functionality on those devices. According to Apple's website, the latest carriers supporting the eSIM feature ('https://support.apple.com/en-ca/HT204039') include AT&T in the United States; Rogers and Fido in Canada; 3 in Denmark and Sweden; Orange in Poland and Spain; Telia in Estonia and Finland; Telenor in Norway; Swisscom and Sunrise in Switzerland; Vodafone in Qatar; and select others. AT&T's website confirms that it supports eSIM on the latest iPhones as of iOS 12.1.1 ('https://www.att.com/esupport/article.html#!/wireless/KM1288682?gsi=9ZbULQg'), while Apple's website continues to state ('https://support.apple.com/en-ca/HT209096') that Verizon and T-Mobile will offer eSIM service "later this year ('https://www.macrumors.com/2018/10/30/us-carriers-esim-support-later-this-year/')." 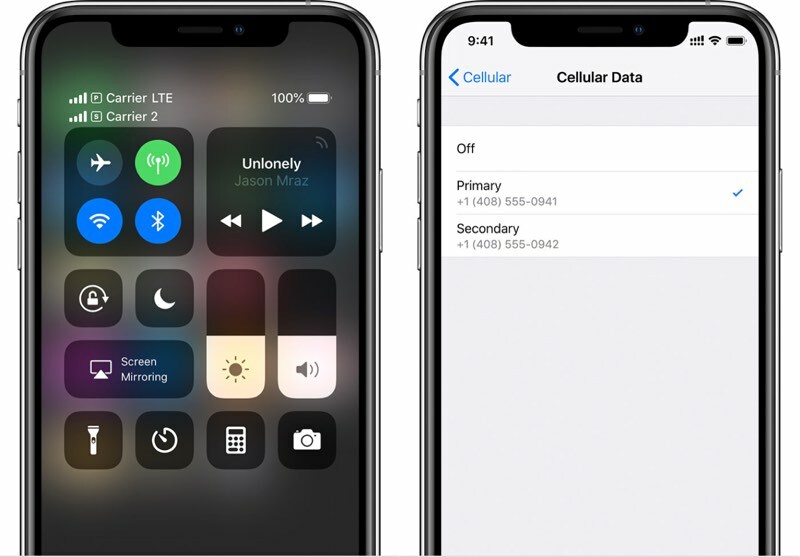 We've heard from a few people that Verizon may enable support on Friday ('https://forums.macrumors.com/threads/apple-releases-ios-12-1-1-with-expanded-esim-support-redesigned-facetime-with-live-photos-haptic-touch-for-notifications-on-iphone-xr-and-more.2158824/page-4#post-26880225'), but this is strictly word of mouth. The eSIM, or digital SIM, is a non-physical SIM card slot that pairs with the physical SIM card in the iPhone XS, iPhone XS Max, or iPhone XR to enable dual-SIM dual-standby, a feature that lets iPhone users have two phone numbers available at once -- useful for travel or both personal and work lines on a single iPhone. I have two phones today - one from my employer (which they own and pay for), and my own. Any word whether this dual SIM support will work with two different payers? Same carrier (Verizon). It would seem like any issue would be a biller / provisioning issue rather than a problem on the device itself. I don’t think it works with two CDMA providers - in your case Verizon x2. It would not be an issue if your personal or work would be either AT&T or TMo. In November, I was traveling overseas and I was begging an ATT rep to activate my esim on account that others were having theirs activated. I wanted to move my main number to the esim so while traveling I could add a sim card for data. But I ended up finding a service called Gigsky and was able to data through the esim. What a lifesaver and now I don't care if ATT ever supports esim. I found something that works.